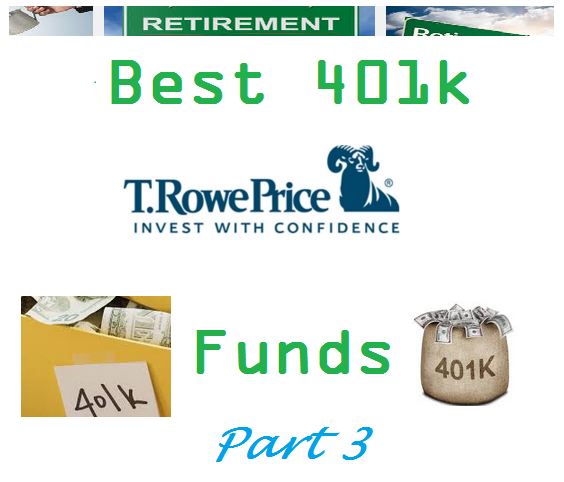 Find part 2 article of T. Rowe Price’s best 401k funds. These mutual funds are popular among investor in retirement account such as 401(k) accounts. T. Rowe Price is an American publicly asset management firm. It manages more than $738 billion of investment assets. 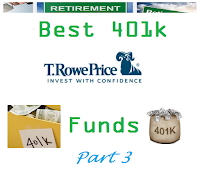 As one of the largest players in 401(k) plans, T. Rowe Price provides lot of high rated mutual funds for your 401k account. These top T. Rowe Price mutual funds carry extraordinarily low expense ratios. Low fees aside, we wondered how good these funds really are, so we analyzed them. These top funds are listed among the best funds for your retirement account. They also may be listed as the best funds by Morningstar, Lipper, Forbes, US News, Kiplinger, and others. Morningstar has ranked this stock fund with 5 stars rating and gold rating. This top fund has returned 12.87 percent over the past 1 year, 20.16 percent over the past 3 years, and 15.57 percent over the past 5 years. Top 5 stocks in its assets are Fiserv Inc, Norwegian Cruise Line Holdings Ltd, CarMax Inc, IHS Inc Class A, and Textron Inc.
T. Rowe Price New Horizons Fund invests mainly in a diversified group of small, emerging growth companies, preferably early in their corporate life cycle. The fund manager is Henry M. Ellenbogen since 2010. It has $14.9 billion of assets. Its expense fee is 0.79%. Top 5 stocks are SS&C Technologies Holdings Inc, O'Reilly Automotive Inc, Restoration Hardware Holdings Inc, DexCom Inc, and Allegiant Travel Co LLC. Top 4 sectors are technology, consumer cyclical, healthcare, and industrials. T. Rowe Price Retirement 2015 Fund has a dividend yield of 1.80%. With assets of $9.5 billion, it has a low expense ratio fee of 0.62%. The portfolio turnover rate is 14%. This target fund invests in stocks and bonds. In 2015, it has year to date return of 1.04%.